(Nanowerk News) A new type of graphene aerogel will make for better energy storage, sensors, nanoelectronics, catalysis and separations. 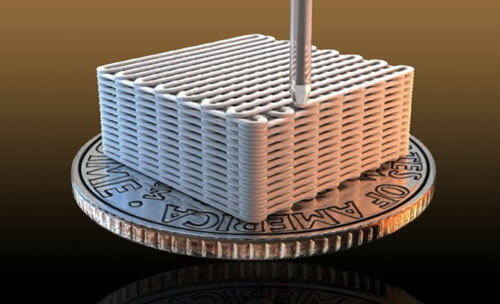 Lawrence Livermore National Laboratory researchers have made graphene aerogel microlattices with an engineered architecture via a 3D printing technique known as direct ink writing. The research appears in the April 22 edition of the journal, Nature Communications ("Highly compressible 3D periodic graphene aerogel microlattices"). Lawrence Livermore researchers have made graphene aerogel microlattices with an engineered architecture via a 3D printing technique known as direct ink writing. "Making graphene aerogels with tailored macro-architectures for specific applications with a controllable and scalable assembly method remains a significant challenge that we were able to tackle," said engineer Marcus Worsley, a co-author of the paper. "3D printing allows one to intelligently design the pore structure of the aerogel, permitting control over mass transport (aerogels typically require high pressure gradients to drive mass transport through them due to small, tortuous pore structure) and optimization of physical properties, such as stiffness. This development should open up the design space for using aerogels in novel and creative applications."